There's always one kid who's too unstable even for the other bullies to hang out with. Diving silently through the air on his huge black wings, Makuta Vamprah strikes fear into the hearts of even the other Brotherhood members. He's ready to crush the Toa Nuva with his Mask of Hunger, vicious hook claws, razor-sharp wing knives, and Tridax Pod with shadow leeches. Vamprah is a freaky-looking critter even by evil Phantoka standards. 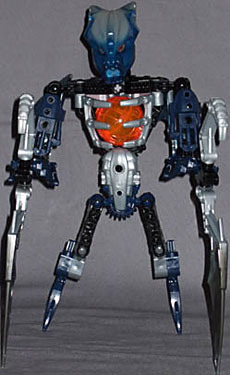 In the middle he's built pretty much like any other Bionicle, but the further out towards the extremities you get, the stranger things become. His legs are short and very stubby, with the regular longish lower legs and feet replaced by a fairly small pair of blades, with no extra armour or anything to bulk them out, not even on the thighs where there's usually extra plates of some kind. Conversely his arms are huge, with the upper arms (fitted with one of the larger armour plate pieces) connecting to bulky forearms containing a double-ended "hand," with a thick hook on one end, and a long bat-like wing on the other, with yet another wing attached to the back of each elbow. As you'd imagine, getting him standing is a bit of a job - your only real option is to have one or both hands angled so that the wrist wings support his weight, otherwise he'll tip right over every time. He's well articulated, of course - ball neck, shoulders, elbows, wrists, hips and knees (no ankles, since he's got no feet) - but even so the necessity to keep at least one wrist wing on the ground limits the poses he can strike. He winds up looking kind of awkward - to me, it brings to mind the pterodactyls from Jurassic Park III, when they came walking jerkily out of the mist. Only good part of the movie; still, that was one more good part than the second one had. Vamprah's head - or rather, mask, since his head is the same as all the other Phantoka Makuta - it's similarly freaky, with a wide crest extending backwards, and a permanently open fanged mouth (now he's reminding me of Leech from She-Ra). The crest's fade into silver at its trailing edge is one of the few spots of bright colour on him, along with the silver torso pieces and claws, and of course the bright orange beach ball stuck in his chest. This thing - the Tridax Pod - contains the shadow leeches, which when released swarm about and attack anything that's not evil, or something. 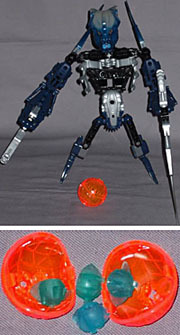 They're represented by little more-or-less spherical rubber pieces with fanged faces - and Technic plug ports in the back of them, if you want to attach them to something - which go inside the two-piece sphere, which in turn sits inside a claw arrangement that takes the place of the usual Bionicle upper body piece. The claw itself - the silver part - is mounted inside the frame by two free-turning plugs, so that it can be pushed open from the back, releasing the pod, which generally pops open on hitting the ground. Like all Phantoka (and Mistika), Vamprah gets lonely left to his own devices, so he's got a buddy to cheer him up. 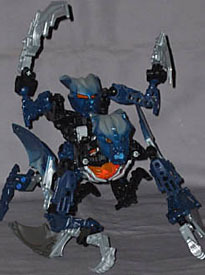 In his case it's Gavla - not the Matoran with blades for feet, but maybe whoever drew up the buddy system decided that each pair would need at least one member who could walk straight. The two share the same colour scheme and mask design, with Gavla's naturally being smaller and less elaborate, and with the connecting piece between the two of them being an L-beam, Gavla gets to ride Vamprah around like a pony, rather than go piggy-back as the Toa pairs do. Hey, whatever makes them happy, right? 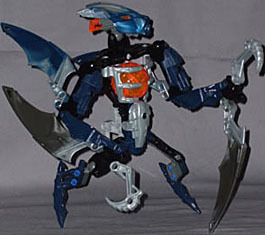 I wouldn't honestly say there's a bad toy in the whole 2008 Bionicle range, but Vamprah isn't up there with my favourites. I like the idea of the wing-claw things, and using them rather than regular feet to keep him upright, but in practise they're not implemented quite well enough; you often find yourself posing him, then having to change the arm positions to keep him upright. Nice idea, so-so execution.